Do you love text fabrics? How about sewing themed quilt blocks? 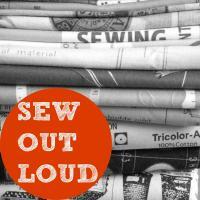 I invite you to join the Sew Out Loud Quilt Along. I'm fortunate to be one of the designers along with 10 incredibly talented sewists! You can join here on Kirie's blog - Shape Moth. And if you do there is a kick off give away. The two prizes are Electric Quilt Company software and a FQ bundle for Stoffsalon. You have until February 11th to join the QAL and win these fabulous prizes. I hope you will join in on the fun!